I love this sweetness of English tea and was really glad, that this kind of tea would be served within a minute. 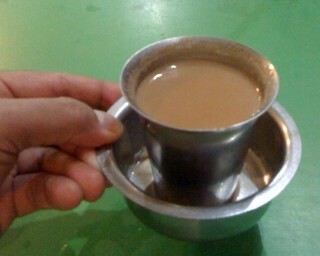 But one day within a second I felt shocked by the Indian version of the English tea. Of course they served strong tea with milk and sugar, but the milk ………………was cooked and poured into the tea, so that the milk skin was also poured into the coup. – To be honest: I really don’t like milk skin. I hate it. And I asked the woman who had offered me the tea if she could give me just tea and sugar without milk. We both could communicate in English, so she understood the words, the meaning of the words but she didn’t serve me tea without milk and sugar. She looked at me, starred yet smiling, and I got the impression, she had not understood anything what I had said and did not move. I explained it again to her. The same effect. No tea without milk and sugar. I tried again, then asked my Indian friend to translate it to the woman in her mother-tongue. Still the same effect: No Tea without milk and sugar. My Indian friend broadly laughing helped me to understand by pointing out, that the woman had never done this before: serving a cup of tea without. When I had asked her she had felt completely lost, so that she could not imagine that this could be real. Simply to say, she could not do that, what she could not imagine to be or to happen, or to be real. She understood the words. She understood the meaning. So she knew what to do, but she had never done it before and therefore she even could not imagine a cup of tea without milk. So again simply said she did not do it. So I did not get a cup of tea. What is the lesson learnt concerning intercultural nonverbal communication I asked myself. You can change words, you can change opinions, you can explain that what you want to have or want to be done. And even when the person can understand all of your words, the person will not act. It depends, and that was my lesson learnt, on the experience a person has made. It depends on the experience which is connected with a special habit of the person and of the culture. So to get something done which the other does not know, because has never done or experienced it before, you have to reach the person on the experience level, on the cultural level. Not like many Westerns do. They try to reach the people on the rational level, the cognitive level. That is of course connected to the Western kind of experience. But it does not automatically fit to other cultural experience levels. When remembering my experience in India I also remember other stories which I was told by managers who try to handle similar situations in order to do a good job. And I remember the astonished faces they talked about. Many of these managers almost went crazy or angry or desperate when experiencing similar situations. Situations which seem so easily to be solved but so hard to face in reality. The difficulty which I want to point at is the cultural gap of experience which often makes it impossible to have something done. Or to have someone to learn this or that. Though the spoken words are understood. Though the spoken language is understood. The deep gap results from the cultural differences and it is incidental that you have to join a new process experience to find some sense. And this has to be done together. Another experience I had was on the island of Sumba in Indonesia. The people lived there in a state of stone age. They were not able to plant or to let some food to grow. Even when they starved to death. Once when I was there, the people did not have enough to eat. And they went to the woods and took some food, which they had to put into water for three days. Otherwise it was intoxicated or not eatable. As they were completely hungry they eat the food at once and many people died. Monks and missionaries who lived there and were completely accepted had tried to show them how to use a plough to plant cereal. The people from Sumba thus knew what to do. BUT they did not start to plant any cereal. Instead of this they took the risk to die.